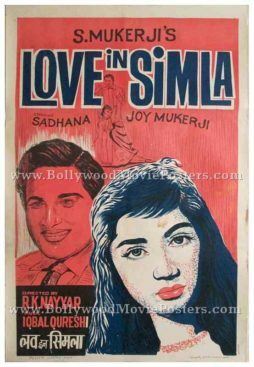 Old hand drawn Bollywood film poster of the hit Hindi romance, Love In Simla (1960) for sale. This is an actual surviving vintage Bollywood poster of the 1960 romantic Hindi film that featured Joy Mukherjee and Sadhana in lead roles. Love In Simla was actress Sadhana’s first lead role in a Hindi film and catapulted her to stardom, making this poster highly collectible. Printed and circulated a few years after the first release of the film (somewhere in the late 1960s), this old Bollywood movie poster was printed for publicity of the film but never ended up being used. This vintage Bollywood poster was originally designed on a hand painted canvas by poster artist B Mohan at an art studio in Delhi, giving it a very quirky appearance. Hand drawn portraits of Joy Mukherjee and Sadhana are seen prominently in the poster set against a very vintage and retro faded pink background. Artist B Mohan’s signature is seen on the bottom right hand corner of this old hand drawn Bollywood poster. This vintage Bollywood poster has been graded as ★★★ Average mainly due to visible stains and discoloration of paper. Overall excellent display condition.